Walk away from the samosa. 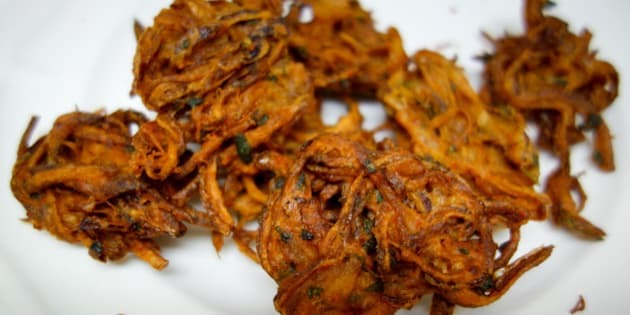 If you're a fan of greasy onion pakoras or sweet, sweet jalebi, it doesn't mean you can't find healthy alternatives that still taste great. Registered dietitian Robin Arora-Desilet of Radnut says if there is one downfall of the South Asian diet, it would have to be the snacks. "Fill your snack trays with natural almonds, natural cashews, pistachios in their shells, apricots, dates, roasted chickpeas or roasted edamame," Arora-Desilet says, instead of filling your pantry up with spicy cashews, sev (crunchy chickpea noodles) and other fried munchies. And while the South Asian diet may not be commonly dubbed as the world's healthiest diet, there are staple ingredients like garlic, turmeric and ginger that are powerful superfoods on their own. Below, Arora-Desilet goes through seven common South Asian food types and how to find a healthier alternative. And no, this doesn't mean you need to give up the deep-fried or prepackaged stuff altogether — moderation is key.